EMODnet Human Activities » News » Where Are the Missing Munitions Under the Sea? Where Are the Missing Munitions Under the Sea? Dumped munitions under the sea are located in many places, some of them unknown. The dumped unexploded ordnance (UXO) includes conventional munitions, bombs, grenades, torpedoes, projectiles and mines. These range from giant aerial bombs of hundreds of kilograms to small detonators, high-explosive shells, as well as incendiary devices or individual items. That is, there are hidden dangers undersea, nobody knows how great the danger really is. Since World War II the unexploded ordnance in the sea are a historical legacy representing a risk for fishermen, other coastal users, marine species and ecosystems. For example, ammunition can appear in fishing nets. Hundreds of fishermen have been injured during their maritime work. 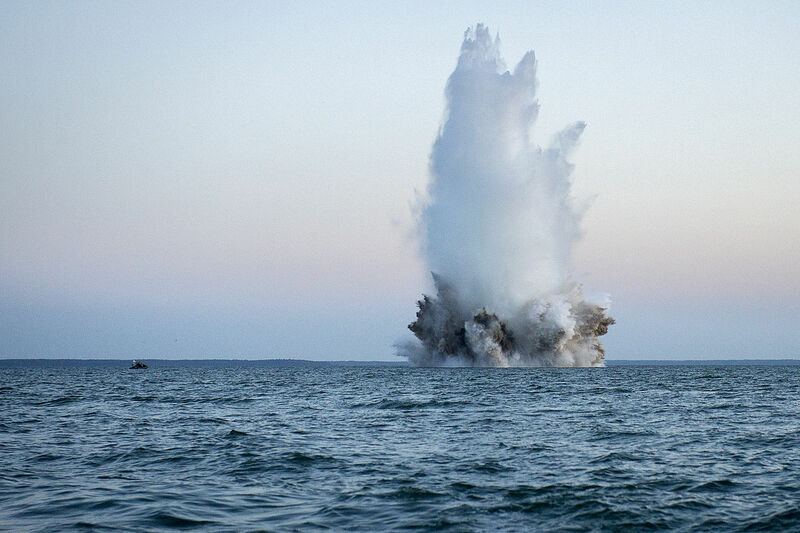 Although there are nautical maps identifying certain areas as “contaminated by munitions” or “contaminated by munitions gas” and warning that “anchoring and fishing are hazardous”, there could be explosions from unexploded ordnance almost anywhere. It is also true that information regarding the amount and location of dumped munitions is recognized to be incomplete and should be considered in marine spatial planning. The OSPAR Convention entered into force on 1998 and has been ratified by Belgium, Denmark, Finland, France, Germany, Iceland, Ireland, Luxembourg, Netherlands, Norway, Portugal, Sweden, Switzerland and United Kingdom and approved by the European Union and Spain. The HELCOM Convention entered into force on 2000 and has been ratified by Germany, Latvia, Sweden, Estonia, Finland, Denmark, Lithuania, Poland and Russia. It covers the whole of the Baltic Sea area. The Barcelona Convention adopted in 1976 was the Mediterranean Action Plan, replaced In 1995, by the Action Plan for the Protection of the Marine Environment and the Sustainable Development of the Coastal Areas of the Mediterranean and has been ratified by Albania, Algeria, Bosnia and Herzegovina, Cyprus, European Community, Croatia, Egypt, Spain, France, Greece, Israel, Italy, Lebanon, Libya, Malta, Morocco, Monaco, Montenegro, Slovenia, Syria, Tunisia and Turkey. The Bucharest Convention was signed in Bucharest in 1992 and ratified in 1994 by Bulgaria, Georgia, Rumania, Russia Federation, Turkey and Ukraine. Their aims are to prevent, reduce and control the pollution in order to protect and preserve the marine environment and to provide legal framework for co-operation and concerted actions to fulfil this obligation. The Centre Technological of the Sea (CETMAR) is involved in EMODnet, concretely in Human Activities. 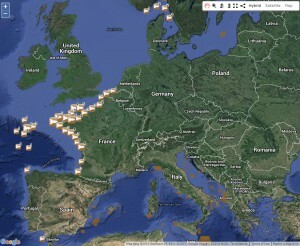 One of our main tasks is the data collection for European basins in relation to dumped munitions. The EMODnet Human Activities website provides access to GIS data in order to meet the needs of public authorities. At this moment, the replies received from official sources regarding dumped munitions are very different, varying from country to country and even between institutions of the same country. In addition, some institutions refer to portals like OSPAR´s and HELCOM´s for oceanographic data. At this time we can see on the EMODnet Human Activities map the available data referring to dumped unexploded ordnance. There is currently an absence of information on the Black Sea, Celtic Sea, Baltic Sea and The Greater North Sea.